Ask the child to identify each food item, and to count them (9). Ask the child to identify which items belong in the refrigerator, and which belong in the freezer. 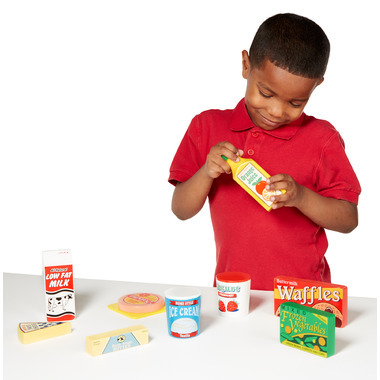 Ask the child to identify letters of the alphabet on the food items. 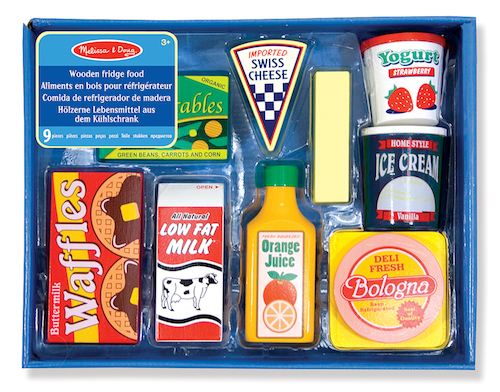 Ask the child to prepare a make-believe meal using the Fridge Food items. Play "store" and ask the child to fill your grocery order. Ask the child to stack the Fridge Food items as high as he/she can before they topple. Looks great tad on the smaller side but will definitely last longer than the traditional cardboard ones. Also have other M&D kitchen items and they're great. Excellent product as are almost all Melissa and Doug toys, these fridge foods are perfect for the kitchen we bought for our grandsons. The boys love that they are colourful, look like real food and are sturdy (cannot be crushed like fake plastic cans or flimsy cardboard boxes). I love that they are all solid wood and will last through all my many grandchildren!! SUPER fast shipping (2 days from ordering to delivery) and the best price I could find online was through well.ca. I recommend the product and the seller 100%. Products look great and are wooden which is a bonus (will last longer) however slightly smaller then anticipated. Still happy with it. 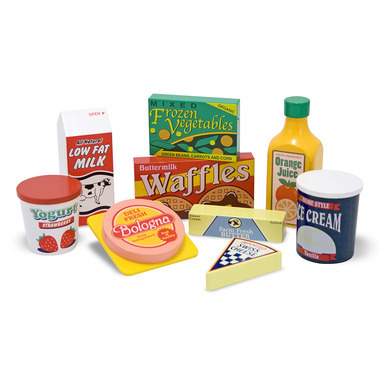 I cannot say enough good things about these fridge products, or anything by Melissa & Doug. These are made of solid wood, they are painted well, and are great for learning and imaginary play. My daughter is 18 months and loves these. We also have the M & D fruits, vegetables, and pantry products. I highly recommend them! These have been the hit of Xmas for my daughter. She's been making "meals" everyday for her family. Definitely would recommend.